Not that long ago, the Intel Drone Light Show Team helped TIME Magazine create the first-ever magazine cover that used drones. That show included nearly 1,000 drones and was a whopping 100 meters high, making it one of the largest drone shows in history. But even that world-record-setting drone show didn't hold the record for long. Intel one-upped itself on July 15th with an even bigger display in honor of the company's 50th Anniversary. At its headquarters in Folsom, California, Intel's Drone Show Team took 1,500 drones to the skies to offer a performance marked by multicolored light displays that looked like fireworks in the sky. Editor's Tip: Take your photos to new heights by turning them into high-quality prints. See what your photos look like as fine art. As you can see in the video above, the show was nothing short of spectacular. Perhaps even more spectacular is the fact that a single pilot maintains control over the entire fleet of drones. The show told the story of Intel's journey, showing data spheres floating in clouds that were shaped like the company's original logo. Then the drones moved into the shape of Intel's first commercial microprocessor, the 4004, which was released way back in 1971. 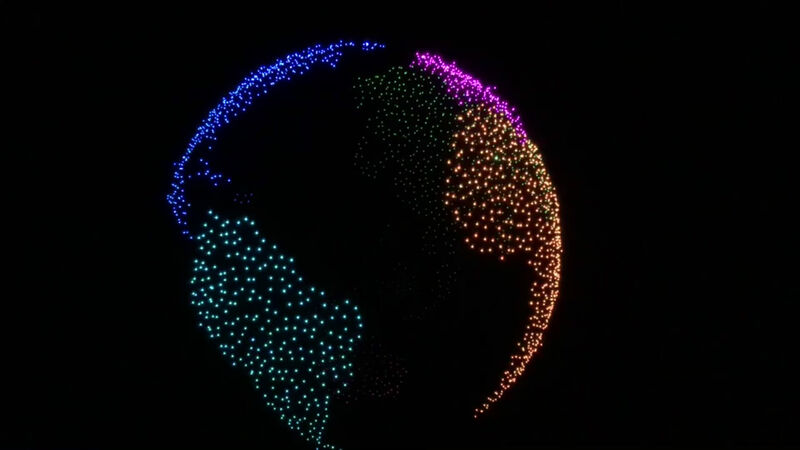 After that, the drones took the shape of the earth to symbolize the fact that the company has employees the world-over. The show ended with a disco party of dancing figures and an arrangement in the form of the company's special 50th anniversary logo. It's really quite a feat of design and engineering. And if you've ever flown a drone for photography purposes, you understand just how difficult it must've been to fly 1,500 drones at the same time. Though Guinness Book of World Records has not officially verified the show as being the new world-record holder, there doesn't seem to be any doubt that the organization will bestow the record to Intel once again.